The Badgers football program released their entire 2012 football schedule earlier this week, finally putting to rest speculation on the upcoming year. Wisconsin has long been a program which, despite its historic success, was undercut by less-than-challenging regular season schedules. This year, head coach Brett Bielema took advantage of laxer Big-Ten scheduling rules to change that perception, moving games to accommodate four out-of-conference opponents. Those four are highlighted by Brigham Young University, who visits Camp Randall on November ninth. Bielema had to move up a planned September twenty-eighth conference opener against Purdue a week earlier to get the Brigham Young game scheduled, meaning that the Badgers begin their Big Ten schedule a Saturday before the rest of the conference. 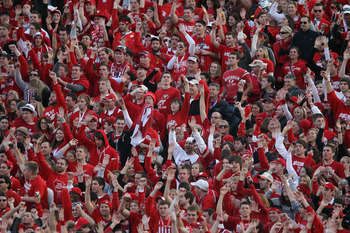 Two other non-Big-Ten teams will also make their way to Madison. Massachusetts will make the trip on the last day of August, kicking off the Badgers season, before Tennessee Tech visits the following week. Wisconsin's first away game comes against their third out-of-conference opponent in as many games, Arizona State, who they will meet on September fourteenth. The Badgers head into five consecutive conference games starting with Purdue at Camp Randall on the twenty-first. They play their first conference opponent away from home on the twenty-eighth, when they play the Buckeyes in Columbus. October is a strange month for the team, as they play just two games, four days apart. Northwestern comes to town on the twelfth, before the Badgers travel south to face Illinois on the nineteenth. The Badgers then wait nearly two weeks before playing the Hawkeyes on November second in Iowa. Wisconsin wraps up the final full month of play with home games against Brigham Young, Indiana, and Penn State. Those three match-ups are straddled by an away game against Minnesota on the twenty-third, and the Big-Ten Championship game in Indianapolis on December seventh.